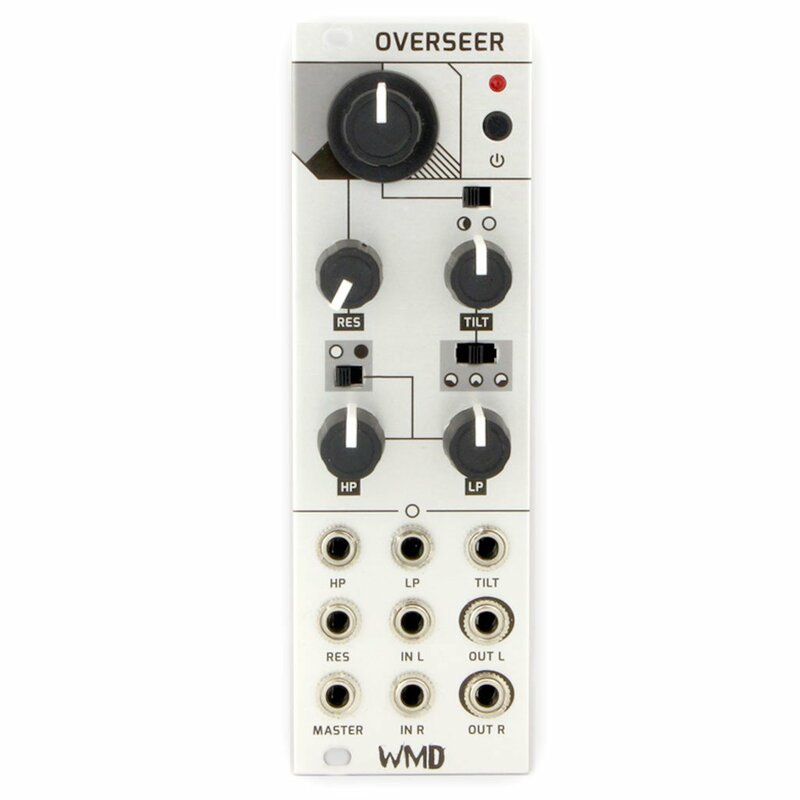 The WMD Overseer is a stereo filter inspired by those commonly found on DJ mixers and DJ software. It features two filters on one knob, stereo ins and outs, bypass switch, and a fun stereo "Tilt" function which offsets the filter cutoff frequency across the stereo field creating some dizzying stereo effects. - High-Pass and Low-Pass on one knob. Bypass Switch: Turns the filter on and off. LED will be red when the filter is engaged. Toggles on button release. Filter Cutoff Knob (the big one): Turn Left for Low-Pass filtering and Right for High-Pass filtering. No filtering in the middle. Becomes offset with CV. Filter Cutoff Switch: Switched to the left limits both filters to audible frequencies so you cannot accidentally filter out all signal. Switched to the right disables the limit allowing you to filter the signal into oblivion. Resonance knob: Controls the amount of frequency boost at the cutoff point. Will not self oscillate. Knob becomes offset with CV. Tilt Knob: In the middle applies no tilt. Rotate left or right to off set the offset to the filter cutoff on each side. Knob becomes offset with CV. Tilt Switch: Allows you to apply the Tilt function to either or both HP and LP. Left for LP, right for HP, center for both. HP - LP Knobs: Attenuverters for incoming CV over the filters. HP - LP Switch: Switch to the right sends 5V to the HP - LP knobs and turns them into independent controls for the cutoff frequency of both filters, allowing you to control both filters at the same time with these independent knobs.